Are you confused by the bike lane markings? If you’re confused by the new bike lanes, read on …. Comments Off on If you’re confused by the new bike lanes, read on …. Want to know more about bike lanes in the Pike District? Check out this presentation by MCDOT on current and future bike lanes in the Pike District. What do you think about glow-in-the-dark bike paths in Pike District? Comments Off on What do you think about glow-in-the-dark bike paths in Pike District? Great news for Pike District Cyclists! 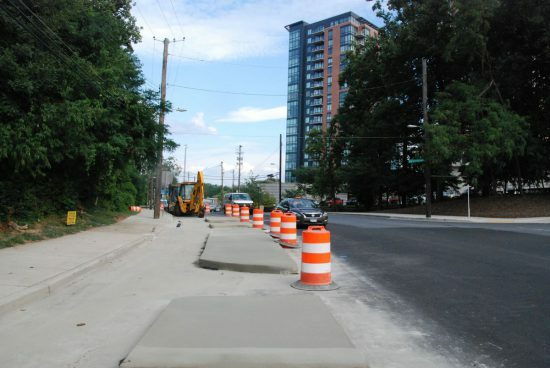 Comments Off on Great news for Pike District Cyclists! The long awaited, much-anticipated, thoroughly planned (and re-planned) Nebel Street bike lanes are actually being built! If you build it, they will bike. And do so safely. Comments Off on If you build it, they will bike. And do so safely. Would Quick-Build Bike Lanes Work for the Pike District? Comments Off on Would Quick-Build Bike Lanes Work for the Pike District? Many cities have embraced quickly deployed, temporary, community-driven projects to define bike lanes. According to an article in Wired, the idea is to come in, lay down some paint, and see how cyclists and motorists react. It’s call the “quick-build” method.